Home resourceNewsletters National Financial Literacy Month – Building Your Toolkit! National Financial Literacy Month – Building Your Toolkit! We know it’s a touchy subject, but let’s talk about money! 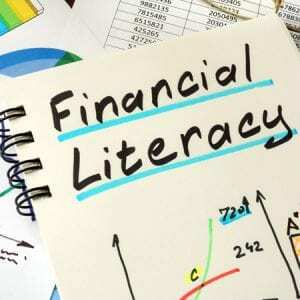 Want to know your financial literacy score? Take our short, 10-question quiz where you’ll be able to see how financially literate you are. Do you have what it takes to get a perfect score? Click the image below to take the quiz and feel free to share the link! In 2004, the U.S. Senate passed resolution 316, recognizing April as National Financial Literacy Month in an attempt to improve personal financial well-being and reduce the stigma attached to talking about personal financial health. While personal finance is still very much taboo for most people, take a few minutes this April to set three financial goals for yourself to help reduce the stigma of personal finance. The choices don’t have to be major life changes, take a few small steps that help to bring you closer to your financial goals. Do you buy a coffee each morning? For just one month, make a cup at home before heading out the door and watch the savings pile up! Sure, it seems like a major change for the first week, but after that point, you’re well on your way to an extra $1,000 a year that can go towards something that advances your goals! To help you advance your financial know-how, we’ve put together a short video series looking at pertinent topics in personal finance based on what you’ve told us you need. The videos are each fewer than two minutes and cover: net worth calculation, fraud, student loans, savings accounts, budgeting, 401Ks, identity theft, and more! Have additional questions? Visit the Mercadien Foundation’s website and our Facebook page.